Location has become paramount to building new apps, services, experiences and business models. If data is the new oil, then location is the crude oil. This is why most of the top location platform players have been developing technologies to power next-generation autonomous mobility systems. And the “richness” of location data and real-time intelligence are becoming strong monetization opportunities. 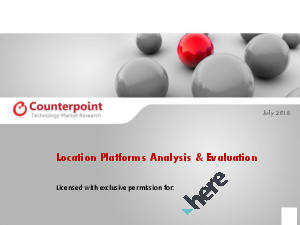 The 2018 Counterpoint Research Location Ecosystems Update compared 16 location platform vendors, including Google, TomTom and Mapbox. Learn why the HERE Open Location Platform – described as super-rich, always up-to-date, and a neutral offering – is a leader in the location data arena.